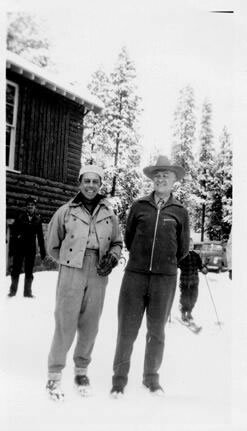 The Arapahoe Lodge's history has everything to do with a perfect ski vacation experience. 2009 celebrates the lodge's 35th anniversary. Rich and Mil Holzwarth and their children (now adults) Jan and husband, Greg Roman, Brad and Todd have lovingly operated the Arapahoe Ski Lodge since 1974. That was before there were sidewalks and street lights- when the town was still named Hideaway Park. It was before Mary Jane, and snowboards, when a day of skiing at Winter Park Ski Area was $7.50; when old Ski Idlewild boasted a $6 lift ticket; and lessons at both resorts cost a whopping $8. It was before snowmaking equipment allowed the resort to open early, and when phone calls still went through a friendly local switchboard operator, and calling Granby from Winter Park was long distance. "Our number at the lodge then was Winter Park 8222," Jan recalls. In those days, no fewer than 15 mountain lodges hosted skiers and tourists from around the world. They operated on the Modified American Plan, with packages offering five days of lodging, meals, and lift tickets for two for $135. Well, prices have gone up a bit. But Mil suggests that a stay at the Arapahoe Ski Lodge is comparable in price to a stay at a condo at the base of the ski area, "but here, you get your meals, too." Mil and Rich Holzwarth left a busy city life and Rich's chemical lab career to buy the lodge they saw listed in the Wall Street Journal. A leap of faith, a willing family, and lots of determination culminated in their buying the lodge in June of 1974 from Ed and Beryl Parrington- who then purchased and operated the Tally Ho close to Fraser. Rich remembers the huge snowstorm the day after they closed on the lodge that dumped more than three feet of snow. "It buried our Gremlin," Jan adds. In the Holzwarths' premiere season, the lodge was booked for Christmas- and there was no snow. Guests began to arrive early Christmas week. Ready to ski, they asked Mil when it was going to snow. "Christmas Eve," Mil assured them-and, sure enough, as they served their first Christmas Eve dinner, the snow started falling and didn't stop. Those early years at the lodge saw the Holzwarths hosting locals for Thanksgiving dinner, since there were few restaurants serving on Thanksgiving. The place was packed and thankful friends looked forward to the feast every year. Growing up at the Arapahoe Ski Lodge was both fun and hard work for the Holzwarth kids. "We weren't allowed to go out for winter sports in school because we had to work," says Jan. But there were rewards. When the chores were done, there was skiing. Other ski lodges in operation included Idlewild Lodge, Timberhouse, Beaver Lodge, High Country Inn, Woodspur, High Forest Inn, Yodel Inn, Sitzmark, Miller's Idlewild Inn, Brookside, Winter Haven Lodge, Tally Ho, Outpost Inn, and Devil's Thumb. Like the Arapahoe, most had a bar, sauna and hot tub. Now, only a few of the grand old lodges remain. Condos and hotels have taken their place, and guests who frequent them unknowingly sacrifice a romantic, unique experience only a ski lodge can offer. Most of the lodges in the 70s were members of The Winter Park Resort Association, which met regularly, offering cooperative marketing to the lodges and ski areas. Meetings would always end in a friendly gathering at one of the lodges. Mil remembers how the lodge owners used to help one another with groceries, extra beds, and cooking when there were urgent needs. That's still the case when the Holzwarth sons, both firefighters with the East Grand Fire Department, are called out, leaving their lodge duties. Jan, the official baker, still makes many of long-time friend and former baker Twila Groswold's recipes, while Jan's dad, Rich, is famous among locals as "the doughnut man," getting up early every Wednesday to make his special cake doughnuts for guests and neighbors. We fill up on fresh fruit, eggs, homemade bread, bacon and sausage, and enjoy the pretty surroundings. Red geraniums fill the dining room windows, and a crystal chandelier sparkles in the sunlight. Jan brings my apple spice tea in a teapot nestled in a crocheted tea cozy. I ask her how the Holzwarth family fared, working all these years together. Jan laughs as she notes they all just do what has to be done. With the help of a couple of hired hands, they manage to care for the big lodge together, taking turns with laundry, room cleaning, baking, grilling, carving, waiting tables, cooking, bartending, hosting, plowing, greeting, booking and shuttling. "Not all of us get mad at the same time," she jokes. "We all do each other's jobs." Mil makes sure I understand this has been a family business. "Rich and I couldn't have done this without them," she says. It was the spring of 1924 when an 8-year-old girl from Hot Springs, Ark., arrived in Hot Sulphur Springs by train to spend the summer with her aunt and uncle Hattie and Omar Qualls, homesteaders from Parshall who had recently purchased the Riverside Hotel. It wasn't the first time Margaret Wilson had been to Hot Sulphur. Her father had tuberculosis and was frequently prescribed treatment at the sanatorium on the Front Range. She was 6 years old the first time she made the train trip. She remembered a boy and girl twin she had befriended on her first visit. When she saw the twins again on this second visit, they told her there was a boy in town who was calling her his girlfriend. His name was Lloyd “Barney” McLean. Margaret made sure to attend the opening of the new school in Hot Sulphur that spring (now the location of Pioneer Village Museum). When Margaret first laid eyes on her future husband, she wasn't all that impressed. “I immediately knew who he was, and I thought, ‘Ugh. '” He was wearing wool knickers, leather boots, a V-neck sweater and a flat cap. “He had white hair and millions of freckles,” she recalls. That white-haired boy from Hot Sulphur went on to become one of Grand County's earliest and most heralded Olympic skiers. He and Margaret would eventually travel the world together. They danced with Hollywood stars and shook hands with presidents. But their love story began right there, in a that little neighborhood schoolhouse. “We all had a crush on Barney until Margaret came to town, then it was all over,” one of Margaret's best friends used to say. At some point, she said, the banker's son asked her out, but she found him dull compared to Barney. Barney was the oldest of 10 children — five boys and five girls. When the family outgrew the house his dad built a tiny shack for Barney in the backyard. Barney was barely big enough to see over the dashboard when he started driving a truck for his father's garage, which was located just up the street from the hotel. He was just 12 years old when he drove a load of dynamite over Trough Road. There were stories of the brakes overheating on Rabbit Ears Pass and Barney riding down on the fenders in case he had to bail and hairy trips over Berthoud Pass. Margaret said she never realized how good Barney was at skiing. He worked all the time driving the truck (his dad pulled him out of school for good in 10th grade), and he would head straight to the jumping hill in Hot Sulphur after work and wouldn't come home until after dark. “He didn't have the proper clothing,” Margaret said. “He wouldn't even be able to open the door when he got home and he would stand at the door crying until his mother let him in.” His mother would bring him in, take his boots off and put his feet in a bucket of hot water to thaw them. “For him, it was skiing for the joy of skiing,” Margaret said. Barney raced on the weekends. Margaret rarely made it out of the restaurant to join him. It never struck her that skiing would someday become her husband's career. “He was never one to blow his own horn,” she said. He qualified for Nationals in jumping in 1935 at age 17, and his dad gave him a quarter to make the trip. "Here was a kid from a town that nobody had ever heard of who shows up at Nationals and wins it," his only child Melissa McLean Jory said. He qualified for the 1936 Olympics but was badly hurt on a wind-blown landing that winter and missed going. Margaret returned to Hot Sulphur almost every summer of her life after that, and by the time she was a teenager she was working for her aunt full time. “My friend Telly and I were the best waitresses in the county,” she said. Hot Sulphur had four ski hills back then and Margaret recalls that in February 1936 the Rocky Mountain News sponsored an excursion train to the 25th Annual Winter Carnival in Hot Sulphur. More than 2,000 passengers arrived on three trains that weekend. (That same train later became the official ski train. “There were no restrooms and no restaurants except for the hotel,” Margaret said. The Riverside was inundated. It was shoulder-to-shoulder people, she recalls. There wasn't much to do for fun in Hot Sulphur back then, like now, so the young couple would drive up to Grand Lake — to the Pine Cone Inn — on summer nights to dance. It cost 10 cents per dance, and since they didn't have much money, they would have just three dances ... “Oh, Barney could dance,” ... drink a Coke and then drive home. Margaret would wait by the front window of the hotel to watch for Barney, who she knew would be going to meet the train at 11 a.m.
One time, she was out there waiting, the snow was still piled high, and Barney got so caught up looking for Margaret in the window that he nearly ran the truck off the bridge. The only thing that saved him from plummeting into the river was the dual wheel that got stuck in the steel girder. Barney was 19 in 1937 when the couple married, not old enough for a marriage license and barely able to afford the suit he bought to get married (the first suit he ever owned) not to mention a big wedding. The couple eloped in Denver. Shortly after they married the couple started traveling the country for ski races and Barney switched from ski jumping to slalom. He was named as an alternate for the 1940 Olympic squad after skiing alpine for only two years. But, then the war came and everybody was signing up. Barney, with his skiing experience, would have been a perfect candidate for the 10th Mountain Division, but another Hot Sulphur friend who had already joined wrote and said, “Don't join this outfit. It's a mess.” So he signed up for the Air Force instead. As luck would have it, somebody recognized his name as it came across his desk, and Barney was assigned to the Army Air Force Arctic Survival School in Edmonton, Alberta, Canada, where he was in charge of teaching pilots how to survive in snowy conditions should their planes go down. Margaret came back to Hot Sulphur during the war and worked in the county courthouse. After the war, Barney earned a spot on the 1948 Olympic team. After that, he went on to work for the Groswold ski factory in Denver, losing his amateur status and disqualifying him from FIS ski racing. He was inducted into the US National Ski Hall of Fame in 1959 and the Colorado Ski Hall of Fame in 1978. Barney had spent his whole life on the snow. He skied all over the world, from Europe to South America. "But Hot Sulphur Springs was always home to him," his daughter said. "He was an ambassador from Hot Sulphur wherever he went." Barney was 3 years old the first time he skied and he skied the spring before he died — at Mary Jane in 2005 — in a foot of new snow. His grandsons skied down with him, wing men on either side. His health was bad that last time he skied, and he had a hard time walking from the car to the chairlift. But as soon as he hit the top of Mary Jane Trail, everything eased, Melissa said: "He could ski better than he could walk." It was the things that made Barney McLean a world class skier that Margaret loved most: He loved speed. Bumps didn't bother him. And, when faced with a challenge he just picked a line and was gone. 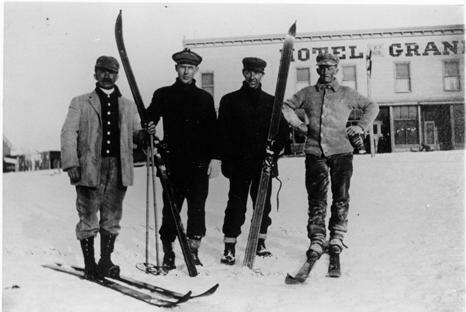 In the early to mid-1900s, the popularity of skiing spread across the western United States. Ski areas popped up in many mountain communities, particularly in the Colorado Rockies. Much of this was due to access afforded by the existence of railroads to these areas. Railroads broke the barriers of isolation during the winter months when most other forms of transportation were blocked (skiing being the exception). Grand County has long depended on tourism. From its earliest days of settlement, tourists were drawn to the springs of Hot Sulphur Springs and to the waters of Grand Lake and its surrounding streams. 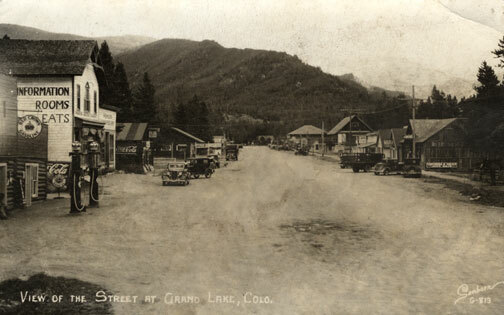 Grand County was reached by stagecoach from Georgetown, via the Berthoud Pass Wagon Road. In the summer months tourists would fill up Hot Sulphur Springs’ five hotels. Nonetheless, those same hotels would sit mostly vacant during the long winter months when the road was shutdown. In 1911, Hot Sulphur Springs held the first winter sports carnival west of the Mississippi River. The purpose of the carnival was to boost the town’s economy by filling the empty hotels and restaurants with out of town guests for that one weekend at the end of December. This was only possible due to the Moffat Road railroad, which had broken the town’s isolation just six years prior. Not only did the railroad bring spectators for the winter carnival, it also brought the two most important participants of the event. At least, it brought them part way. Carl Howelsen and Angell Schmidt boarded the train in Denver’s Moffat Station and rode it to the top of the divide at Corona, where they detrained and skied the rest of the 40-plus miles to Hot Sulphur Springs, where the carnival was under way. Once re-united with their fellow train passengers, Howelsen and Schmidt performed the biggest event of the day, the ski jump competition, which made history. The ski jump competition at the 1911 Hot Sulphur Springs Winter Sports Carnival was the first west of the Mississippi and is considered the beginning of Colorado’s ski industry. The 1911 winter carnival was such a successful and enjoyable event that it grabbed the attention of Denver newspapers on the front pages. Consequently, John Peyer and the other carnival organizers of the carnival decided to make it an annual event and put together the 1st Annual Hot Sulphur Springs Winter Sports Carnival six weeks later in February 1912. The railroad was the sole reason that the success of the winter carnival at Hot Sulphur Springs was even a possibility in those early years. Berthoud Pass, the former wagon road converted to an auto route was closed in the winter months. Even if the highway were open, automobiles of that day could not have made the winter drive anyway. The railroad was the only way to bring people to the remote town in the winter and take advantage of the abundantly snowy hills. The Moffat Road quickly realized the potential for profit that the Hot Sulphur Springs Winter Carnival presented in the typically slow winter months of the railroad. In 1913, the Denver and Salt Lake Railway (D&SLR) advertised a special round trip fare to Hot Sulphur for the winter carnival. The following year, further up the Moffat Road, Steamboat Springs held its first winter carnival.. Once again, the D&SLR provided the means to reach the new ski destination. People road the rails from Denver and Hot Sulphur Springs. As the popularity of Hot Sulphur Springs as a winter destination grew, so did ridership of the D&SLR to the winter carnival. In 1936, the Rocky Mountain News sponsored the “Snow Train” to Hot Sulphur Springs for the 25th anniversary of the winter carnival. Despite the fact that Berthoud Pass was open year round starting in 1933, over 2,200 passengers rode the ironhorse from Denver and another 500 came over the Moffat Road from Steamboat Springs for the event. Over 7,000 people attended the carnival that weekend. In the early years of the ski industry, Nordic was the dominant form of skiing. By the late 1920s, Alpine skiing began to grow by leaps and bounds in the United States. This coincided with the opening of the Moffat Tunnel, which made the railroad far more reliable in the winter time. It would be at the west portal (West Portal) that the railroad would make its biggest impact on skiing in Colorado. Following the opening of the Moffat Tunnel, skiers would ride up to West Portal from Denver to slide the deep and steep slopes immediately adjacent of the tunnel. 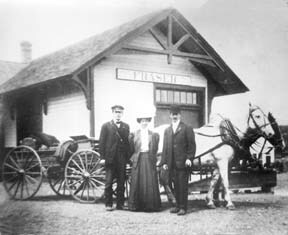 Not long after the opening of the tunnel, the Arlberg Club was formed and they built their clubhouse not for from the tunnel to take advantage of the rails from Denver to the slopes on the west side of the divide. Arlberg Club members and other ski enthusiasts flocked to West Portal by rail throughout the 1930s, even though there was no formal ski area. Skiing and riding the train to West Portal was so popular that in 1938 the D&SLR started the “Snow Train,” offering regular weekend service to West Portal. The D&SLR even provided a place for skiers to wax their skis in the West Portal Depot. The start of the Snow Train coincided with decision of Denver Parks Director, George Cranmer’s decision to locate Denver’s Winter Park at West Portal. Cranmer announced his intention of creating for Denver a winter sports playground that would be “unequalled in the world. When he determined that West Portal would be the location for Denver’s Winter Park he referenced the great ski conditions of the area and additionally remarked that “West Portal may be reached by auto or train.” Cranmer clearly recognized the importance of access by train from Denver. As ski trails were cut and T-bars were installed on the mountainside the base area facilities for Winter Park were literally constructed on the tailings of the Moffat Tunnel. This provided easy access to the facilities and slopes of the ambitious new ski area for those riding the train from Denver. The D&SLR continued to provide the Snow Train weekend service when Winter Park opened in 1940 for $1.75 per round trip. Unfortunately, due to the demands of World War II and a coal workers strike in 1943, the Snow Train service came to an end. This would prove to be temporary though. In 1946, one year after the end of World War II, the Denver and Rio Grande Western (D&RGW) brought the special weekend service back to Winter Park and christened it as the “Ski Train.” This was the foundation of the Ski Train that ran between Denver and Winter Park until 2009. Grand County was not the only ski destination that benefitted from the railroads in the early growth years of the ski industry in the west. A couple of major examples are Marshall Pass in Colorado and Sun Valley, Idaho. Beginning in 1938, the D&RGW literally acted as a chairlift for skiers from Salida and Gunnison. A special excursion train on the weekends selling seats as lift tickets to the top of Marshall Pass. The first train sold out with 500 tickets and 200 skiers were turned away that day. The railroad even provided a warming hut at the bottom of the slopes. In possibly the greatest example of the railroad on the ski industry of the west is Sun Valley, Idaho and the Union Pacific Railroad (UP). Sun Valley was literally the conceived, constructed, and operated by the UP. Under the leadership of Averill Harriman, who was a ski enthusiast himself, conjured up the plan to build a world class ski destination that would rival any in Europe. This resort was to be reached by rail as a means to boost ridership on the UP, which it did. 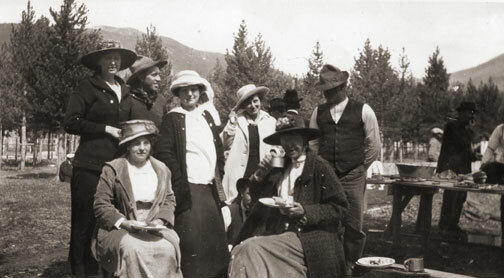 Sun Valley became the glamorous playground for the rich and famous. At Sun Valley, skiing was elevated in class and viewed as elite. Nonetheless, it was at Sun Valley that the railroad made its most significant contribution to the ski industry. The first chairlifts in the world were installed at Sun Valley in 1936, replacing the rope tow. Engineers for the UP developed the chairlift at the railroad’s headquarters in Omaha. The invention of the chairlift transformed the method of how skiers were to be transported to the top of ski trails the world over. The impact of the railroads on the development of the ski industry in the western United States cannot be understated. Without the assistance of the network of steel that penetrated into remote mountain locations, the ski industry could not have developed with the rapidity that it did in the early part of the 20th century. Furthermore, as we look to the future of the ski industry and try and figure out ways to conveniently transport skiers to the slopes of Colorado trains emerge more and more as the answer. This is apparent in the rejoice that devotees to Winter Park sang when Amtrak’s Winter Park Express returned weekend service in 2017 that had been left in a void ever since the Ski Train made its last run in 2009. Once again skiers are riding the rails of the old Moffat Road. Grand County was one of the first areas in Colorado to enjoy sport skiing. While mail carriers, loggers and other workers used the "Norwegian Snowshoes" as necessary winter transportation, it was a natural progression to begin racing down the slopes for fun. An 1883 newspaper noted that in Grand Lake "Coasting on snowshoes has taken the place of dancing parties. Quite a number of ladies are becoming adept at the art. First class snowshoers, B.W. Tower and Max James are the best; or at least they can fall more gracefully then the rest". According to famous Hot Sulphur Springs champion Barney McLean, that town had three jumping hills in the 1920s and held the first Winter Carnival in the West there in 1911. By 1925, Denver sent special "snow trains" there for the recreating tourists. Skiers such as Bob McQueary and Jim Harsh competed in statewide events along with skiing "veterans" Horace Button and McLean. Grand Lake's Jim Harsh became the first Coloradoan to qualify for the U.S. Olympic Team. In 1932, the Grand Lake Ski Club held its first winter sports week on Denver 25-January 1st. Featured was a motor sled with an airplane engine which pulled skiers over the frozen lake are speeds of 90 miles per hour. Colorado's first ski tow was opened at the summit of Berthoud Pass in 1936. Berthoud Pass operated on and off throughout the next 60+ years but was finally closed and the lifts dismantled in 2002. 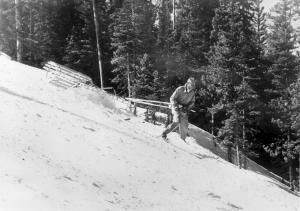 What became the resort of Winter Park featured skiing at the West Portal of the Moffatt Tunnel and the Winter Park Ski Area opened as a result of efforts by Denver Parks & Recreation Director George Cranmer. Early lodging resorts in the area, then known as Hideaway Park (now Winter Park), included Sportland Valley, Timberhaus Lodge, and Millers Idlewild Inn. Eventually trains made daily runs to Winter Park, loaded with intrepid skiers. 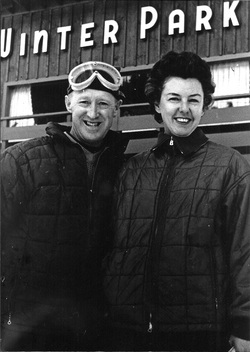 Steve Bradley invented the first effective snow packer on the slopes of Winter Park. With a strong record of winning high school ski teams, Grand County accounted for a remarkable number of skiers who later took park in FIS (International Federation of Skiers) meets and U.S. Olympic teams. A later ski area, now know as Sol Vista Ski Basin (formerly Silver Creek Resort) opened in Granby in the 1980's. World class cross country ski areas in Grand County include Snow Mountain Ranch and Devil's Thumb Ranch. the scent of pine wood, cozy fires, hearty food, friendly hosts, and total relaxation. Sons Elwood and Dwight managed the business, with the vital assistance of parents and friends during the Christmas season and summers. Elwood married after graduating from college and bit by bit, he gravitated to the teaching world, leaving Dwight to deal with eager guests. Idlewild Inn became a popular spot, especially families for seeking simple vacations. However, after a few years, the Millers realized that there was developing a desire for more sophisticated lodgings. the railroad, and along both the Fraser and Vasquez Creek. A pleasant lane wound through the forest from the highway to the creeks and broad meadow. first), and finally took a snooze before evening festivities began. relax or swim. It took all of two weeks to decide on a Pomagowski double chairlift. That summer slopes were cleared and groomed, the lift and warming house built, and the area opened in 1960, two years before Winter Park had its first chair lift. Dwight and Jean even had a fine neon sign at the entry off the highway, one more first. Saturday races, sponsored by Ski Idlewild and George/Hazel Ferris's Mountain Shop drew droves of youngsters. About 1961, Dwight introduced ski bicycles, which were hugely popular. He also started using the first snowmobile for grooming and first aid purposes in the area. In the meanwhile, Jean was identifying snowshoe and cross-country ski trails through the nearby back country. By 1964, their thoughts were turning to snowmaking, to enhance early skiing. To this day, people will walk up to the Millers and say, "Oh, Ski Idlewild! I learned to ski there! Loved it." As for summer activities, trips to areas of interest, swimming, and horseback rides were standbys. In addition, the Millers built a small golf course in the meadow and a trout pond at the bridge, which they stocked. gradually d clined. An era of exciting innovation came to an end. Carl Howelsen, a ski jumping champion in his native Norway, came to Denver to pursue a career as a stonemason in the early years of the 20th Century. He amused himself and others by demonstrating ski-jumping in the foothills of Denver. In 1911, Howelson went to Hot Sulphur Springs, where he taught locals such as Horace Button the art of jumping. Under Howelson's leadership, the first winter carnival west of the Mississippi Rover was held there on February 10-12. According to the Middle Park Times, "Never before in the history of the Territory and State of Colorado has such an event even been contemplated, much less held!". Norwegian immigrants Howelson, Angell Schmidt of Denver and Gunnar Dahles of Williams Fork (Grand County) all staged jumping competitions during the carnival. There were also skating and tobogganing events and a Grand Ball. Hot Sulphur Springs continued holding Winter Carnivals annually until World War II, when they were discontinued until the 100th anniversary celebration, called the Grand Winter Sports Carnival scheduled for December 30, 2011-February 11, 2012. Most serious ranchers had more than one ditch and most built one or more reservoirs. Hilry Harris, Munroe C. Wythe, Samuel H. Burghard, and John A. Coulter entered the first water claim in the county on September 20, 1874. This came out of Sheep Creek above the head of Gore Canyon. There usually was some natural irrigation; but the challenge of getting the water from the creek required laborious construction of diversion dams, headgates, and ditches, the earliest ditches being dug by hand and often taking up to four years to complete. Later, ditches were dug using teams and scrapers. The grade was figured out initially by simple gravity flow, letting a trickle of water move down the ditch. Soon ranchers refined the process, using a 16’ long board placed with a 1/8" slope, determined by a carpenter’s level. A.F. and Roy Polhamus surveyed a great many of the water ditches, especially those impressive ones in West Grand County, some of which even had tunnels involved. Most small ditches supplied just one ranch, but if a ditch had to cross another ranch, that rancher usually got a share. And some of these ditches were long! For instance, Dr. Henry Hoagland, on the Blue River, anticipated getting water close at hand from Spruce Creek. Instead, he discovered an old timer had previous rights that forced him to go back into the mountains and build a 13-mile long ditch. Hoagland had figured on spending about $7000; in the end, the actual cost was $26,000! His crew dug the ditch around side hills and across valleys using flumes and siphons. Then his real troubles began. Terrible leaks and washouts occurred everywhere. Finally he hauled in adobe and put this in the bottom of the ditch, rented sheep, and drove them day after day up and down the ditch to pack it. After a couple of years of using this tamping process, the ditch held. Other ditches were even longer. The Church Ditch at Willow Creek and the Wheatley Ditch on the back Troublesome were both 16 miles long. The Company Ditch (aka the Williams Fork Ditch), eight feet wide on the bottom, was another long one. Built between 1903 and 1907, it cost $44,000 and had a decree for 150 cubic feet / second. The ditch went uphill and down, requiring many flumes and bridges. One flume was actually 1200 feet long! Subsequent breakdowns, leaks, and slides were so frequent and repairs so extremely costly that old-timers have said the reason the Company Ranch went broke about 1920 was the expense of The Ditch. The Lyman Ditch (or the Curtis), started about 1891, was just as complicated as the Company Ditch. Crossing high above the Williams Fork River, the ditch eventually needed cement piers to carry the pipe (1928). This ditch had so many slides, leaks, and washouts, that it had to be inspected once or twice daily! Siphons were required over draws. Flumes, sometimes ¼ mile long, might be 25-30 feet high, and one flume was actually 177 feet high; but these heights were necessary to maintain the elevation. Flumes, being of wood, rotted and were guaranteed to leak. Sometimes wind blew a portion of the flume down. Finally the county put in big pipes to help the ditches across the Williams Fork. It might be noted that, when water leaked out of ditches, a side benefit was that ranchers along the way could use the "lost" water. Along with the ditches came reservoirs. 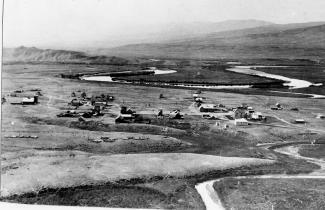 Fred DeBerard had four reservoirs on the Muddy: the Albert, the Binco, Milk Creek, and a low one that flooded the Jones place near Kremmling. All were dirt, of course. The Hermosa Ranch on the Little Muddy had water rights through the Sylvan Ditch and Reservoir Company and they built the Sylvan Reservoir dam and the Hermosa Ditch starting in 1911 and completing it by the spring of 1916. The Stein Ditch, started in 1897, was another large ditch, this one later purchased by the Taussig family. These ditches were all built originally to provide water to meadows and fields for ranching purposes. For years, people hauled in water for baths and household use, but that gradually changed. Leon Almirall, near the Horseshoe Ranger Station on the Williams Fork, decided that he wanted water for his home, so he built a 1700’ pipeline to his house, added an inside bathroom, and was shocked when the line froze the first winter – it was only three feet deep. He called in workers who dug down and insulated the line with manure and straw. It froze again. Finally, Almirall gave up and buried the line six feet deep. Now he had his water! On Ranch Creek in the east end of the county, E.D. Shew cut a ditch upstream from his house, placing it along the edge of the creek, but directing the water back into the main channel near his house. At that point, he put a little water wheel that pushed the water up the hill to his cabins -- and furnished electricity besides. Eventually he replaced the water wheel with a gas engine. There was a similar water wheel, used for the same purpose, up in Hideaway Park. Water was used to transport lumber as well. A flume ran down the mountain into Monarch Lake, in the days when the Monarch Company was timbering there. There was a flume along St. Louis Creek, carrying lumber from the camps upstream. Perhaps the most ambitious flume ran from Western Box Sawmill. This area is now under Meadow Creek Reservoir. In 1906, the Deisher Lumber Company paid Nathan Hurd for a right of way through his land and built a flume with a 2% grade down Hurd Creek. Logs were placed in the flume and a horse harnessed to the last log. The horse then pushed the logs down the flume with the help of the water. Three years later, the mill was moved to "Sawmill Meadow" on Meadow Creek. In 1911 construction on the seven-mile-long Vaver Flume began, with 117 cubic inches of water allotment. This flume ran down Meadow Creek and over to Tabernash, carrying partially processed logs for further manufacture. A flume rider checked along the way, making sure there were no jams, and phone line allowed the rider to report troubles. Hikers can see remnants of both the St. Louis Creek flume and that one coming down Meadow Creek today. Born in Geneva, Switzerland, Eduard Louis Berthoud (pronounced "Bare-too") came to the United States with his parents in 1830. His childhood was spent in New York State along the Mohawk River. After completing a degree in engineering at Union College in Schenectady, he spent a lifetime supporting the great western movement. 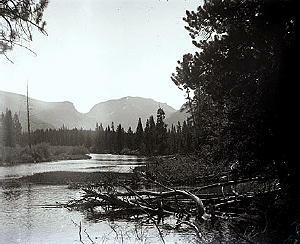 In 1860, Berthoud came to the Rocky Mountains with the Gold Rush. 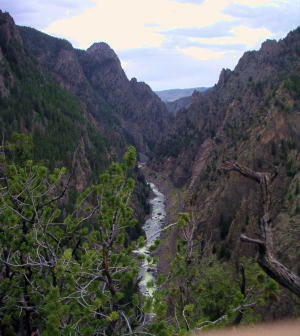 During the 40 years between 1850-1890, Berthoud contributed greatly to the expanding west through his experiences as a young surveyor on the Panama Railroad, the linking of Leavenworth, KS to the Rocky Mountains, and his survey and exploration of a transcontinental road through Colorado's Middle Park. As a Coloradoan, Edward Berthoud (his name now "Americanized) also lead surveys for railroads to booming mining camps in Gilpin County, Georgetown, Leadville and San Juan County. Berthoud's legacy includes his pioneer survey of Berthoud Pass and wagon road through Middle Park into Utah. In addition to his work as a surveyor, Berthoud also helped create the School of Mines and often taught there. He also was involved in various political positions from territorial legislator to Golden's Mayor. He collected natural history specimens for eastern museums that even today are considered extremely valuable. Colorow was a Ute Chieftain who was known for profound stubbornness and bitter resentment of the white man's intrusion into the Ute hunting grounds. Indian Agent Meeker had ruled that that the Utes must depend on the United States government for food supplies, rather than their traditional hunting. These supplies were sometimes held up for delivery and upon their eventual arrival,contaminated. Colorow thought the white settlers of Middle Park (near Granby) were killing too many of the game animals that had been critical in feeding the Ute people. So in the fall of 1878, Colorow started a brush fire high in the Medicine Bow range, planning to drive the deer, elk, and buffalo west to the Ute reservation. But the winds took an unexpected shift, driving the wild game northward and away from Ute territory. The fire drove out the last of the buffalo ever to be seen in the Middle Park region again and it took many years for the forests and ranges to recover from the devastation. Fred Selak was a descendant of early settlers in Grand County. 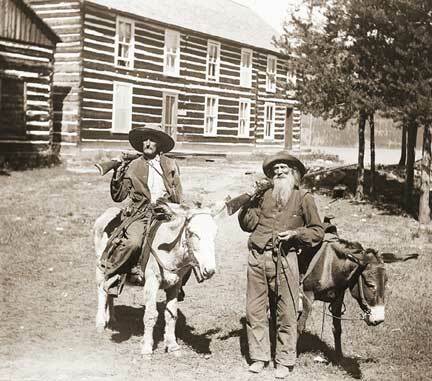 He built a cabin three miles south of Grand Lake where he lived alone. He helped his brothers in various enterprises including mining, a general store and a sawmill. Selak was known to be a prosperous citizen who lent money to others and there were rumors of hidden cash and gold in his cabin. He was also known to be an avid coin collector. 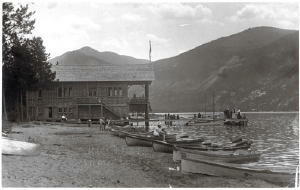 When Selak failed to pick up his mail for several weeks, the postmaster visited his cabin July 26, 1926. After not getting a response to his knocks, the postmaster summoned an employee of Selak's with a key. When they opened the door, they discovered the cabin in shambles and Selak missing. Sheriff Make Fletcher was notified and a nephew of Selak's called in the Denver Police Department. As the investigation progressed, a .22 caliber slug was extracted from the wall and blood was found on an easy chair, but further investigation ruled these clues inconsequential as they were dated to many years prior. Sheriff Fletcher conducted a massive manhunt on August 16th and the body of Fred Selak was found on the second day by a deputy's dog. The body was hanging from a tree and evidence showed that, because of a sloppy knot, Selak did not die quickly of a broken neck but rather suffered a slow strangulation. The murder had taken place a month earlier and the body had stretched until the feet were touching the ground. Arthur Osborn, 22, and his cousin Roy Noakes, 21, became prime suspects after showing off old coins and trying to spend them for minor purchases around Grand Lake. After interrogation by the Denver Police, both confessed to robbing and killing Selak. Later, Noakes claimed that the confessions were coerced by the police. The suspects were kept in the Denver jail until their trial on March 7, 1927 and Sheriff Fletcher had to take great precautions against a possible lynching. The only motive for the murder seems to be based on a land dispute years earlier in which Osborn was arrested for a violating fence line. Both suspects were found guilty and sentenced to death. After many appeals, the convicted murderers were hung in Canon City on March 30, 1928. Maggie and Jimmy Crawford came to Middle Park in the summer of 1874 with their three children. They were given a piece of property and built a one room sod roofed cabin in Hot Sulphur Springs. They were probably the first family to stay the winter in Middle Park. As they settled in for a long hard winter, Jimmy continued exploring lands to the west. He found prime land near a spring that made a unique chugging noise. That sound reminded him of the steamboats on the Missouri River back home. After that winter, Maggie returned to Missouri with her family, while Jimmy built a cabin on the new filing, which would later become known as Steamboat Springs, Colorado. By 1876, Maggie and the children were back in Colorado, and the family became founding members of that new community. As they settled in for a long hard winter, Jimmy continued exploring lands to the west. He found prime land near a spring that made a unique chugging noise. That sound reminded him of the steamboats on the Missouri River back home. After that winter, Maggie returned to Missouri with her family, while Jimmy built a cabin on the new filing, which would later become known as Steamboat Springs, Colorado.